NEXCOM’s complete Industry 4.0 solution optimizes the connectivity between edge and cloud to elevate manufacturing processes, production efficiency, and exchange of production data for an automotive battery factory. A 2018 Hannover Messe from April 23 to April 27, NEXCOM will be showcasing its Industry 4.0 solution roadmap to illustrate how the solution enables smart factory automation within the factory’s device layer, wireless infrastructure within the communication layer, and smart cloud computing within the application layer. This total solution breaks down into five sections – CNC gateway solution, cloud-based automation control system solution, NexROBO EtherCAT-based robotics control solution, wireless solution for automated mobile robots, and predictive maintenance for rotary machinery solution. For CNC gateway solution, NEXCOM will demonstrate how its line of intelligent PC-based fieldbus controller and application-ready IoT gateway automates smart manufacturing processes. Visitors will learn how this product line’s high integration capabilities and easy control programming via Softlogic Tool kit using libraries of reusable logic and motion functionality can simplify programming efforts and increase production efficiency. Visitors will be impressed with NEXCOM’s cloud-based automation control system solution as its iAT2000 starter kit which comprises 5 independent packs to form an all-in-one solution in making factory production process more efficient, productive, and save time and cost for OT/IT integration. This showcase details how each independent pack integrates a set of PC-based controller, device I/O, and local HMI into a specific production process which provides constant access to process control and visualization of field data on its local HMI. Visitors will be able to experience NEXCOM’s exciting Cloud SCADA War Room display which demonstrates data visualization and analysis of real-time field data from multiple sources into one broad overview. NEXCOM’s NexROBO EtherCAT-based robotics control solution will present how manufactures can gain full control of their robotics through NEXCOM’s motion controllers based on a real-time operating system with high expansion capabilities supported by high-performance handheld computers and entry level robot gateways to achieve complete production line automation. The robot gateway’s powerful computing power simultaneously manages and collects large amounts of production data including production status, production time, and robot coordination to send to SCADA for real-time production data analysis. The NexROBO EtherCAT-based robotics control solution lets robotic engineers meticulously program and reprogram robots to the various processing needs within all kinds of smart factory applications. The wireless solution for automated mobile robots will go in details on how NEXCOM’s rugged industrial-grade EZ mesh and industrial mesh Wi-Fi gateway is a cost-effective option for connecting data collection system, cyber physical automation system, predictive maintenance system, automated material handling system, and wireless sensor network in smart factories. This solution allows for easy implementation, resilient connection and scalable coverage for valuable data to be transferred from the production line to cloud and between production sites and headquarters. One of the headliners for NEXCOM’s complete Industry 4.0 solution is the predictive maintenance for rotary machinery solution for smart factories. For 2018 Hannover Messe, the Predictive Diagnostic Maintenance solution kit has been integrated into NEXCOM’s miniBOT, a 6-axis robot package designed for education research, and development, for a live simulation of predicting and analyzing mechanical errors and potential mechanical problems. At 2018 Hannover Messe, visitors will not only be learning about how NEXCOM has tailored a complete Industry 4.0 solution for a smart automotive battery factory, visitors can also enjoy giveaways handed out by NEXCOM’s very own miniBOT. 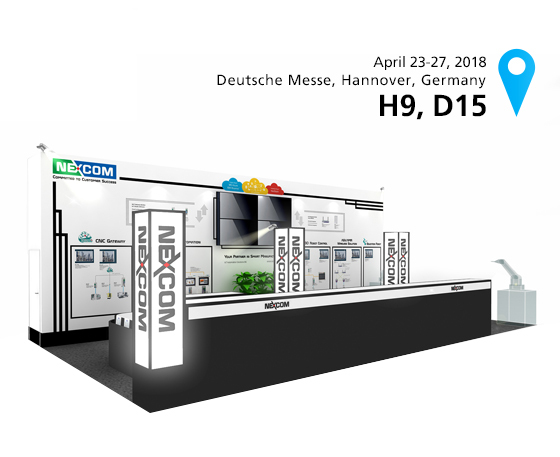 NEXCOM sincerely invites you to visit us at 2018 Hannover Messe, Hall 9, D15, to learn more about NEXCOM Industry 4.0 Solution.